TSRS 5th class Admissions 2017-18 Counselling, Certificates Verification Dates . 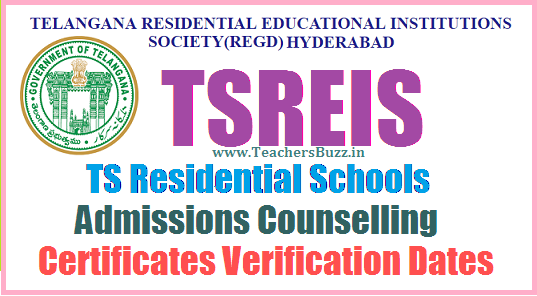 Telangana Residential Educational Institutions Society(Regd),Hyderabad, TSRS 5th class Admissions 2017-18 Counselling in 47 Telangana Residential schools, Certificates Verification TREIS, TSREIS TSRJDC.CGG.GOV.IN, TSRS 5th Class admissions counselling dates, treis 5th class admissions certificates verification dates,list documents,call leters information is given here. TSRS 5th class Admissions 2017-18 Counselling in Telangana Residential Schools:TSREI Officials announced the TSRS Admissions Counselling dates for admission into 5th class in TSR Schools.The 5th class admissions counselling would be conducted on 26/05/2016. results and selected candidates call letters have been placed on tsjdc.cgg.gov.in web portal. So, Candidates should download the call letter and attend the first phase admissions counselling with your hall ticket, call letter and along with relavent original documents and 2 sets of xerox at counselling centre which was mentioned in your call letter on .........by 9.00 AM. 3. Society has shortlisted the candidates based on Rank(merit) in the V Class Admission test conducted on.............., Reservation category, Special category etc to the extent of available seats. 4. Candidates are shortlisted for the available seats in the ratio of 1:1 and informed through SMS and also placed on the website tsrjdc.cgg.gov.in and tresidential.cgg.gov.in. Only parent is called for counseling. There is no need of student to attend the counseling. TSRS 5th Class Admission Test 2017 Notification, Exam date, Online Applications. there is a relaxation of 2 years is must have born 01.09.2004 and 31.08.2008.
ii) His/ her parental income should not exceed Rs 150000 ( Rural) and Rs.200000( for Urban). No income limit for the children of Armed Personnel. iii) Must have studied in Govt/Govt Recognized school consecutively for 2 academic years i.e. 2016-17 and 2015-16.
iv) Must have studying 4th class during the academic year 2016-17.
v) Must belong to Rural Area( School Study area) for admission into General Schools. Rural study condition is not applicable to SC/ST candidates and all candidates of Hyderabad and Rangareddy Districts.